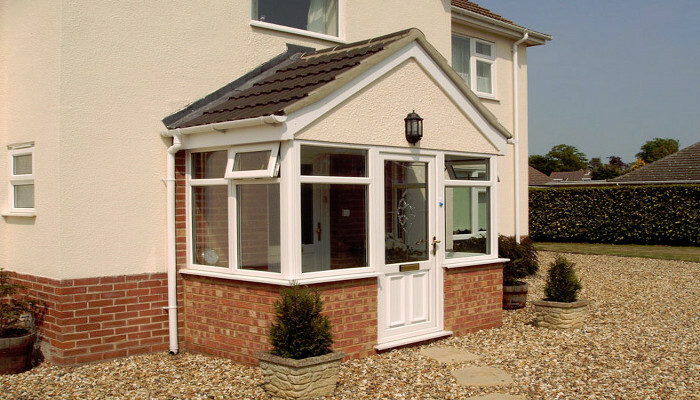 High Quality UPVC Porches from Mister Window – creating the perfect welcome to your home. A porch is essential to provide a weather barrier for when the front door is opened. But for many homes it’s much more than that: a well designed and constructed UPVC porch will add to your comfort, save on heating bills, provide additional security and create a stylish entrance to your home. Our UPVC porches can do all of those. Mister Window Company applies the same exacting standards when designing and building UPVC porches as we do with our other construction products. Once installed, your porch will perform flawlessly for years and help you save on ever-increasing heating bills. No matter what type of property you have, your porch will be custom designed to sit comfortably with its surroundings. It will be tailor-made to your exact specifications of shape, size and glazing. Colours – We offer a wide range of colours for your porch. Whether you want a traditional wood-grain foil, or would prefer a more contemporary look, we can help. Plain colours and pastels work well with most homes and gardens, such as Green, Ebony Black or Mid Grey. Doors – The door type can completely change the look and function of your porch. We have many options for porch doors such as single doors, patio doors, new wave doors or composite doors. Roofs – A good roof doesn’t just keep you dry, it adds to the overall look and feel of your porch as well. We can offer glass, polycarbonate, vertex tile effect and traditional slate or tiled roofs. Internal Fixtures – Make your porch an integral part of your home with electric power points, lighting, heating and wall plastering. We can install a wide range of options to help you feel at home even in your porch.